With its bunches of strikingly red and golden, waxy flowers this prolific flowering grevillea provides a nice splash of colour this time of the year. The branches of Grevillea `Bonnie Prince Charlie’ are reasonably erect off the main stem but arch further down their length. The lanceolate leaves are covered with sparse silky hairs and have margins which are rolled under. Grevilleas are in the protea family Proteaceae and native to Australasia. Grevillea `Bonnie Prince Charlie’ is a hybrid between G. rosmarinifolia and G. alpina and is named for Prince Charles, the Prince of Wales. As a compact dwarf shrub it grows well in containers if planted in a free-draining potting medium. For best results trim to remove spent flowers and encourage vigorous growth and flowering. 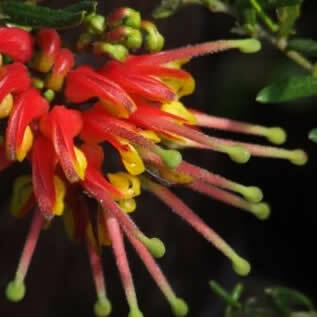 It is essential to keep the plant on the dry side as grevilleas are often killed by overwatering.